These night-blooming varieties of the cactus family are known for their highly fragrant flowers, which humans can smell from a considerable distance—about 30 feet away. Cereus are surprisingly easy to grow. Put them in a brightly lit, cool room for the winter months and move to dappled shade outdoors after all danger of frost has past. Their spiky white flowers bloom in late summer and early autumn, each blossom lasting just a single night. The flowers don't open until well after sunset—at least 10 p.m. for some varieties and even later for others. Cereus are easily started from stem cuttings. Native to the Caribbean, Selenicereus spp. have slender cylindrical stems which turn slightly purple as they mature. Selenicereus spp. are also called “Queen of the Night.” Their flowers bloom for one night each from July through September. Grow outdoors in partial shade during frost free weather. 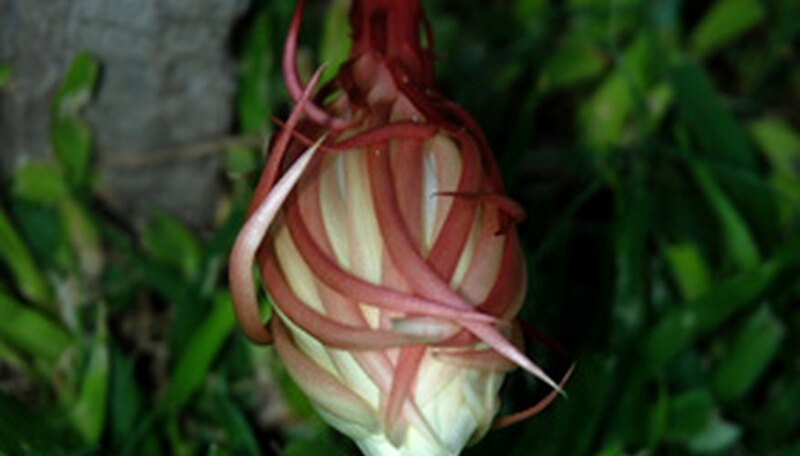 Best flower production occurs if you don't repot cereus until the plants are completely pot-bound. The variety Hylocereus undatus is one of the most common night blooming cereus. Its stems are light green to yellow and can take on a climbing or hanging habit. The flowers are magnificent—often more than a foot wide. Flowers form all along the stem, opening after 10 p.m. and fading shortly after sunrise the following day. For the best flower production, ignore the plant during autumn after it finishes blooming. Put it in a seldom-used cool but bright room and water only when the soil is dried out. Commonly called “Dutchman's Pipe,” Epiphyllum oxypetalum is a type of cereus whose flower petals remain slightly more cup-like than the flatter blossoms of other cereus types. It has dark green leaves growing along reddish-purple stems. Healthy specimens in robust growth rarely bloom. To encourage them to set flowers, withhold nitrogen by feeding in late spring and early summer with a no-nitrogen fertilizer (the first number should be zero, as in 0-10-10). Epiphyllum ceresus types have unique flowers. The buds droop, pointing downward until just before they are ready to open. Then it begins to point upward and opens to a fragrant, white flower about 5 to 8 inches in diameter. What Plants Close Their Blooms at Night?